This was a good trip. With very few exceptions, we had all changed our rigs in someway over the winter. Vic added some RE front springs, Dale put in a BB, Allen added some new rear springs, Kristy got an XJ and we put a BB on that, plus I lifted mine up to around 3.5" and added a winch...so this was a major shakedown run. From there we headed out to the trail head where we got all staged up. Dale and I decided to run this one as a two headed trail boss...besdes we were practically dressed the same anyway. I'm not sure what was up with this...but while we were staging up, this dog started hanging out wth us at the trail head. He ended up following us most of the way up the trail...everytime we turned around he was right there. It was a friendly pooch and the kids as well as adults enjoyed his company. We then made our way up to the clearing. There's a couple of ways into it ranging from easy to difficult. Most people took the easy part of the intermediate path. Once we all got in Dale and I proceeded to break in the wire rope on the winch. Since we were gonna be a minute, we put Jen and Vic in charge of the pack and sent them on up the trail. We got lots of pics and they'll be a writeup on basic winching techniques shortly. Now, Jen and Vic were worried that they would be waiting for us at the top of the trail. But after we finished up, Dale and I got in our Jeeps, WHALED up the trail (even the dog had a problem keeping up) and ended up catching up to everyone...they wheel like turtles. So we made our way up to and just past the AT to the Crabtree Falls parking lot. Since we had 10 Jeeps with us, we didn't want to block up the trail by stopping at the AT like we normally do. Plus there's bathrooms there, so the ladies and kids were happy. At the same spot, Vic decided to play on the rocks that I did in the TJ last year (where I tore the top on a tree). He found the right line through it and it made for some pretty good shots of 'zilla in action. Turns out that all the mud made it so slick that it was not doable without a locker. So I ended up winching myself out. It was the same result though...I ended up winching him out. Like I said at the top...it was a good day. I don't think that anyone even broke anything. 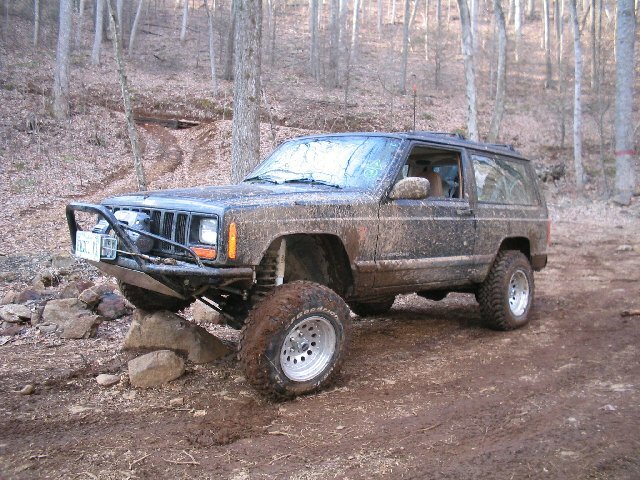 We'll finish off with some XJ flex poser pics. Some flex on the not so stock XJ (formerly the stocker). WHOA! MONSTER FLEX ON THE STOCKER!!! I think that's about it....oh, I can't forget the "Dale is an idiot" picture. Um...Dale, you've been hanging out with that dog a little too much. ...and since I know turnabout is fair play...here's what Dale would prolly use as revenge. Next stop...Land Between the Lakes in Kentucky for the Jeep Horizons South East Run.